Clóna's blog | Page 2 | Clóna Dairy Products Ltd.
We are looking for Warehouse operatives to participate in our Cork city warehouse operations. Full training to be provided. Work week is Monday to Friday with optional overtime at weekends. 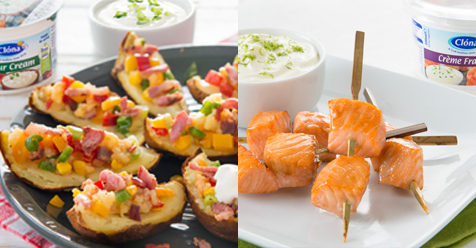 Simple, quick and tasty meal inspiration for when no one wants to spend time in the kitchen! How about some Salmon Kebabs with Crème Fraiche and Lime Zest grated on top? Or try Loaded Baked Potato skins with our Sour Cream and chives. Clóna Sour Cream and Crème Fraiche are currently on offer at only €1 at selected SuperValu Stores! Fantastic Weekend at the Clonakilty Street Festival. Wow - what a fantastic weekend everyone had at the Clonakilty Street Festival! Great atmosphere, fabulous food and lots and lots of entertainment and fun for everyone in the family. Well done to the organisers and volunteers who did an amazing job. We're looking forward to next year again already! Clóna Dairy Products Ltd are now looking for applicants for a number of positions.